Mandeville is a small city in St. Tammany Parish, Louisiana, United States. The population was 11,560 at the 2010 census. 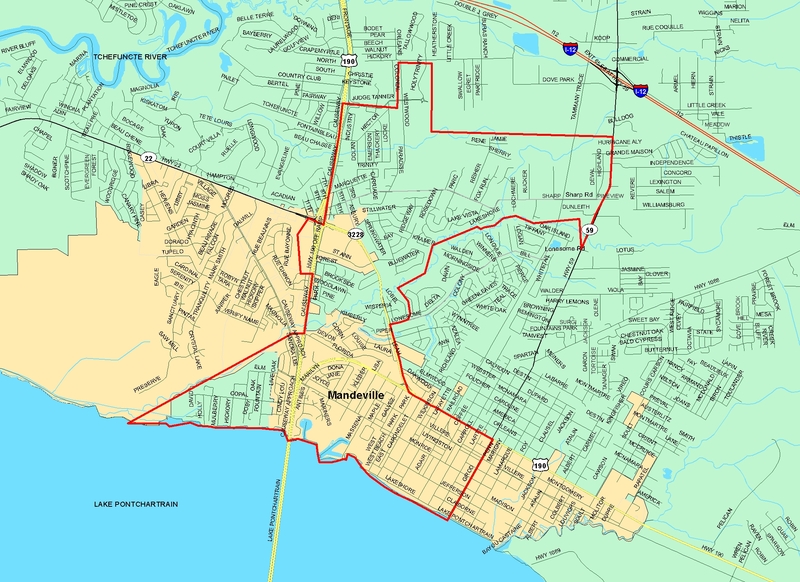 Mandeville is located on the North Shore of Lake Pontchartrain, south of Interstate 12. It is across the lake from the city of New Orleans and its southshore suburbs. It is part of the New Orleans–Metairie–Kenner metropolitan area. Mandeville is the name of two villages in Normandy, France. It means "big farm" (from Magna Villa) in medieval Norman French. 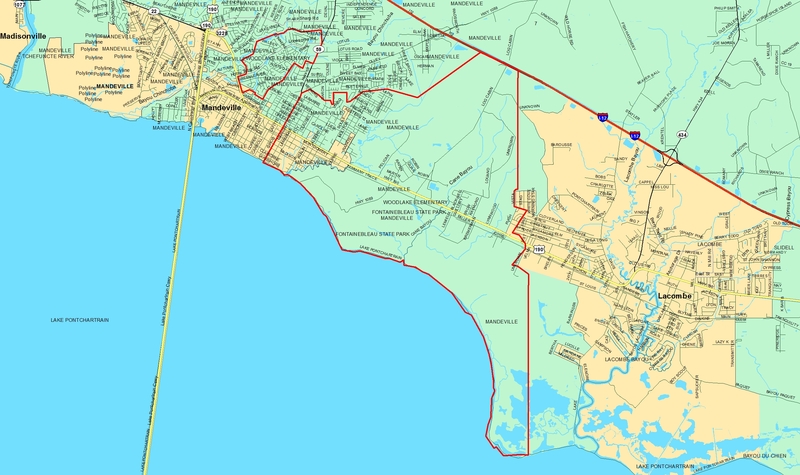 The area had long been agricultural land when the town of Mandeville was laid out in 1834 by developer Bernard Xavier de Marigny de Mandeville, more often known as Bernard de Marigny. In 1840 Mandeville was incorporated as a town. It became a popular summer destination for well-to-do New Orleanians wishing to escape the city's heat. In the mid-19th century, regular daily steamboat traffic between New Orleans and Mandeville began, and by the end of the Victorian era, it had become a popular weekend destination of the New Orleans middle class as well. Bands would play music on the ships going across the lake and at pavilions and dance halls in Mandeville, and the town became one of the first places where the new "jazz" music was heard outside of New Orleans. Bunk Johnson, Buddy Petit, Papa Celestin, George Lewis, Kid Ory, Edmond Hall, Chester Zardis, and many other early jazz artists regularly played in Mandeville. In the late 19th century, Mandeville was home of the Harvey School (Mandeville), a college preparatory institution. Among those educated there was Andrew Querbes, then of New Orleans and later the mayor of Shreveport. In 1956, the first span of the Lake Pontchartrain Causeway opened to automobile traffic. A second span was added in 1969. 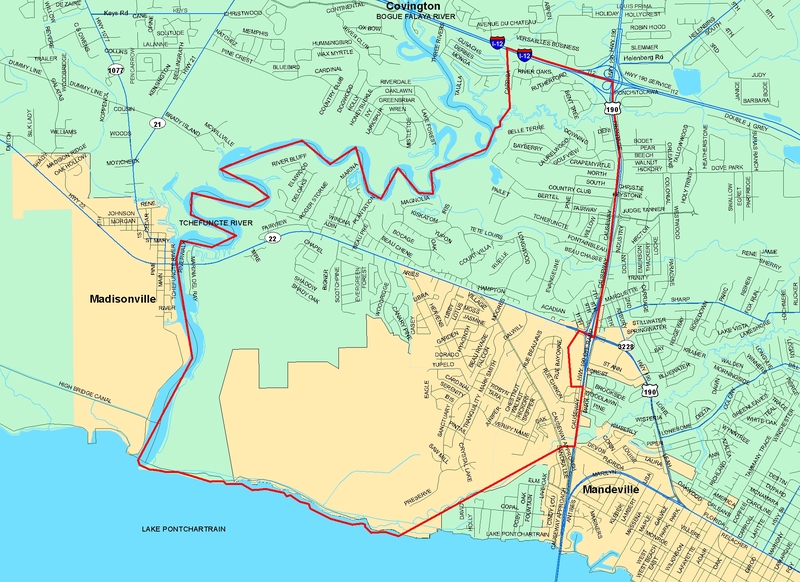 The new road spurred the growth of Mandeville and the surrounding area as a suburban commuter community for people working in New Orleans. This trend increased in the 1980s and 1990s, further integrating Mandeville into the Greater New Orleans metropolitan area. Mandeville is home to Southeast Louisiana Hospital, a mental health facility. Louisiana governor Earl Long was committed here in 1959 amidst much controversy. In July 2012, the Louisiana State Department of Health announced the closure of the hospital, citing reduced federal money from Medicaid. Mandeville is also home to the largest certified southern live oak tree, the Seven Sisters Oak. Mandeville was affected by Hurricane Katrina's storm surge in August 2005 and received water and wind damage. Parts of the city also experienced less dramatic flooding when Lake Pontchartrain overflowed its banks due to Hurricane Ike in 2008. By 2009, most of the reconstruction from Katrina was completed. Many homes and businesses in areas that experienced flooding have been elevated. Mandeville was named one of the Relocate America Top 100 Places to Live in 2004, 2005, 2007, 2008, and 2009. Mandeville was among the recipients of Google's eCity award in 2013, given to those cities whose small businesses most effectively employ the internet to attract customers. Mandeville is the hometown of Cajun fiddler and bandleader Amanda Shaw, the rock group 12 Stones, YouTube personality TJ Kirk, the progressive rock band As Cities Burn, comedian Theo Von, Wilco bassist John Stirratt, and actor and environmentalist Ian Somerhalder. Actress Allison Scagliotti grew up in Mandeville. Willem McCormick lived here for a few years while writing music before moving to Los Angeles, as did former US soccer national team player Jason Kreis before entering MLS. Sirius XM's The Mike Church Show is broadcast from a studio in Mandeville five days per week by Mike Church, who is a native of the city. Singer/songwriter Lucinda Williams spent time in Mandeville as a child and noted the town in her song "Crescent City", which has been covered by others including Emmylou Harris. Former WWE wrestler, Brodus Clay has lived in the city of Mandeville since 2010. 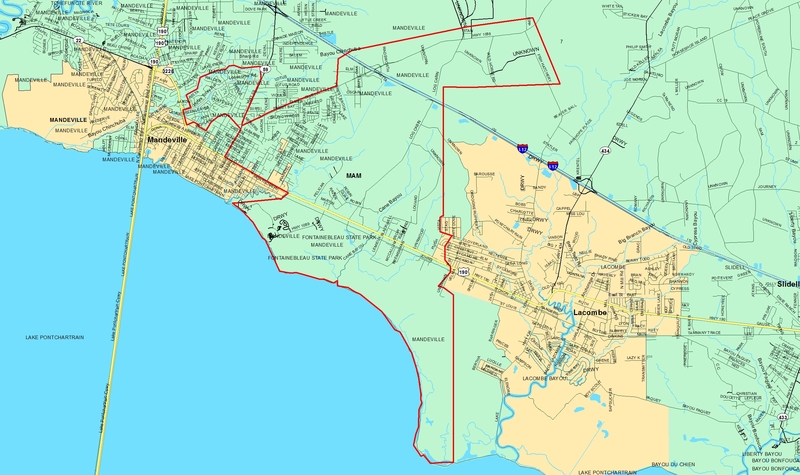 Mandeville has an active political scene, Eddie Price having been elected mayor for several terms commencing in 1996. He stepped down as mayor on October 9, 2009, and subsequently pleaded guilty to charges including tax evasion and depriving citizens of honest services through mail fraud. The city council then selected Edward "Bubby" Lyons as interim mayor. White nationalist and white supremacist David Duke has a residence in Mandeville, and is a perennial candidate. His most notable electoral outcomes are his almost-wins for Senate in 1990 and Governor of Louisiana in 1991. The late Governor David C. Treen spent his later years in Mandeville. The District 89 state representative is Republican Reid Falconer of Mandeville, who has served in the position since 2016. 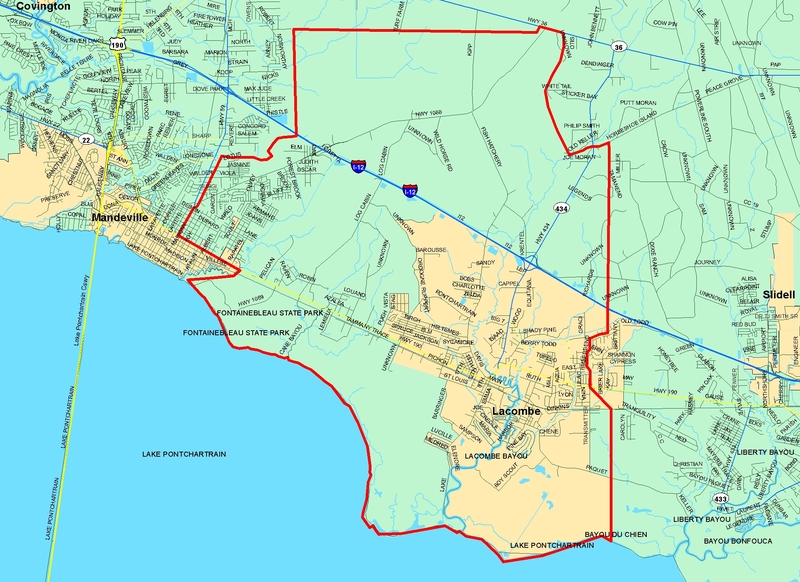 A second Mandeville Republican, Paul Hollis, holds the District 104 seat in the state House effective January 9, 2012. Arthur A. Morrell, a former state representative for District 97 in New Orleans and the current clerk of the Ouachita Parish Criminal Court, formerly lived in Mandeville. Former New Orleans Saints offensive lineman Jim Dombrowski lives in Mandeville. Former Saints wide receiver Rich Mauti lives in Mandeville, and his son, Saints linebacker Michael Mauti, is from Mandeville. Trombonist Mark Mullins (Bonerama, Harry Connick Jr.) lives in Mandeville. Recent mayors include Republicans Paul Spitzfaden (1984-1996) and Edward Joseph "Edward" Price (1996-2009). 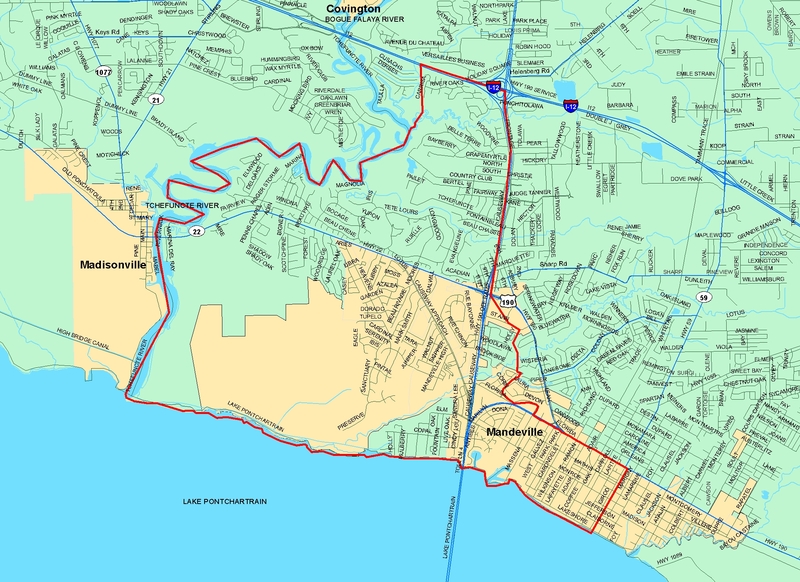 Mandeville is located at 30°22′9″N 90°4′41″W﻿ / ﻿30.36917°N 90.07806°W﻿ / 30.36917; -90.07806 (30.369282, -90.078006) and has an elevation of 7 feet (2.1 m). 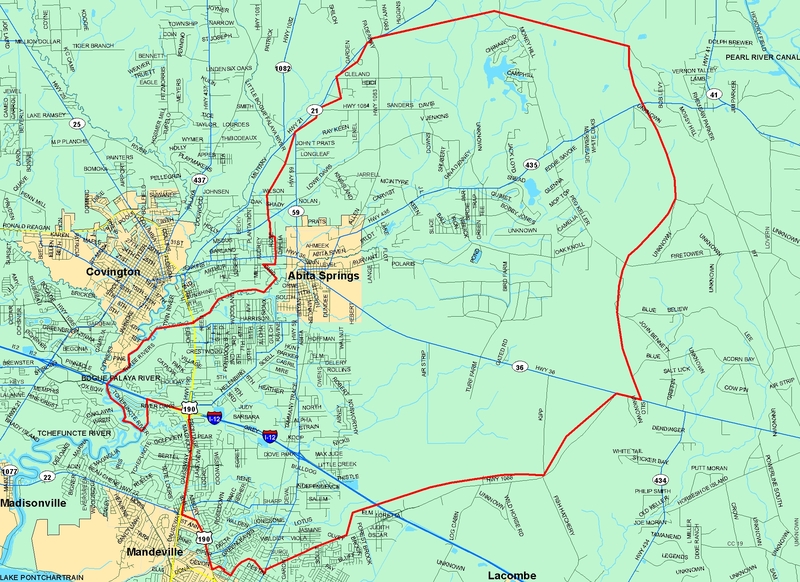 According to the United States Census Bureau, the city has a total area of 6.8 square miles (17.7 km2), of which 6.7 square miles (17.4 km2) is land and 0.12 square miles (0.3 km2), or 1.55%, is water. The Tchefuncte River flows through Madisonville, where a human operated swing bridge still connects suburban Mandeville to Madisonville. It is rumored that pop singer Britney Spears recently purchased a house there. As of the census of 2000, there were 10,489 people, 4,204 households, and 2,724 families residing in the city. The population density was 1,543.1 people per square mile (595.6/km²). There were 4,669 housing units at an average density of 686.9 per square mile (265.1/km²). The racial makeup of the city was 92.15% White, 4.79% African American, 0.31% Native American, 1.16% Asian, 0.06% Pacific Islander, 0.59% from other races, and 0.93% from two or more races. Hispanic or Latino people of any race were 2.43% of the population. There were 4,204 households out of which 35.6% had children under the age of 18 living with them, 50.6% were married couples living together, 10.8% had a female householder with no husband present, and 35.2% were non-families. 29.8% of all households were made up of individuals and 11.4% had someone living alone who was 65 years of age or older. The average household size was 2.46 and the average family size was 3.11. In the city, the population was spread out, with 27.3% under the age of 18, 7.3% from 18 to 24, 28.9% from 25 to 44, 24.5% from 45 to 64, and 11.9% who were 65 years of age or older. The median age was 38 years. For every 100 females, there were approximately 89.2 males. For every 100 females age 18 and over, there were approximately 84.7 males. The median income for a household in the city was $52,500, and the median income for a family was $70,043. Males had a median income of $50,891 versus $30,554 for females. The per capita income for the city was $26,420. About 4.9% of families and 7.6% of the population were below the poverty line, including 7.1% of those under age 18 and 13.7% of those age 65 or over. St. Tammany Parish Public Schools operates public schools serving the city. Elementary schools (Kindergarten-grade 3) serving sections of Mandeville include: Mandeville Elementary, Woodlake Elementary, and Ponchartrain Elementary. A small portion is assigned to Marigny Elementary School (Kindergarten and grade 1) and Magnolia Trace Elementary School (grades 2-3). Grades 4-6: Tchefuncte Middle School serves the majority of the city. Some portions are served by Lake Harbor Middle School, and Mandeville Middle School serves very small portions. Grades 7-8: Mandeville Junior High School serves the majority of the city. Small portions of the city are assigned to Fontainebleau Junior High, and Leonerd Monteleone Junior High. 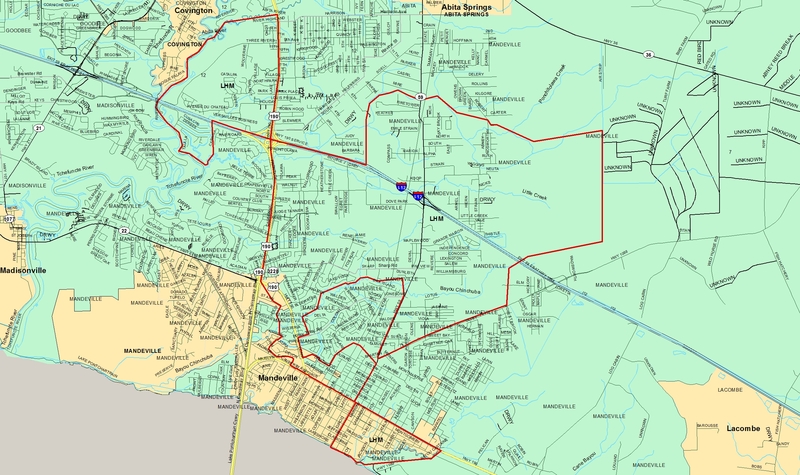 Mandeville High School serves the majority of the city. Small sections are served by Lakeshore High, and Fontainebleau High. ^ "Profile of General Population and Housing Characteristics: 2010 Demographic Profile Data (DP-1): Mandeville city, Louisiana". U.S. Census Bureau, American Factfinder. Retrieved February 17, 2012. ^ "Querbes, Andrew". Louisiana Historical Association, A Dictionary of Louisiana Biography. Archived from the original on 2010-12-01. Retrieved February 2, 2011. ^ Suzanne Le Breton, "Lyons named interim mayor for Mandeville" in St. Tammany News, 2009 October 18 (Vol. 5 No. 21), pp. 1A, 6A. 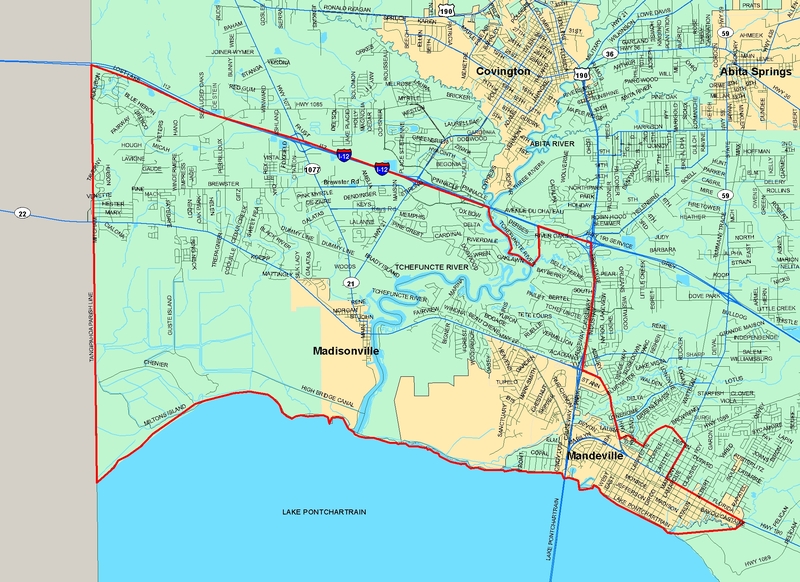 ^ "Geographic Identifiers: 2010 Demographic Profile Data (G001): Mandeville city, Louisiana". U.S. Census Bureau, American Factfinder. Retrieved February 17, 2012. 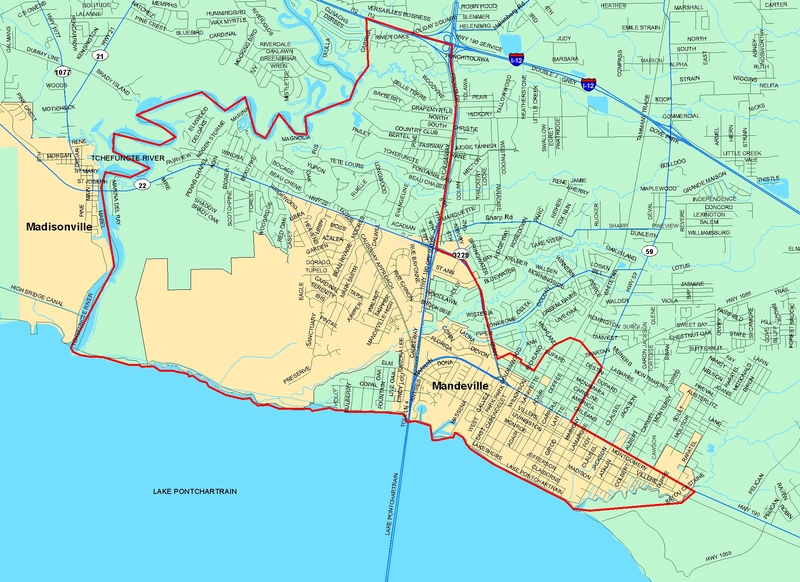 ^ "Mandeville Elementary attendance boundary." St. Tammany Parish Public Schools. Retrieved on July 7, 2018. 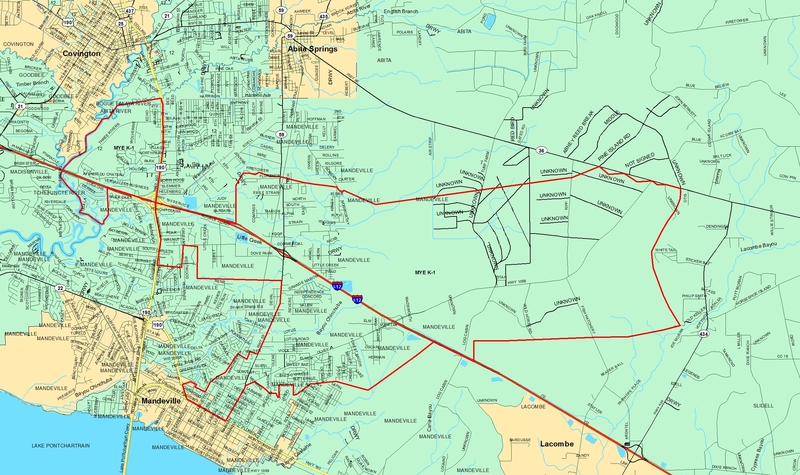 ^ "Woodlake Elementary attendance boundary." St. Tammany Parish Public Schools. Retrieved on July 7, 2018. ^ "Ponchartrain Elementary attendance boundary." St. Tammany Parish Public Schools. Retrieved on July 7, 2018. ^ "Marigny Elementary attendance boundary." St. Tammany Parish Public Schools. Retrieved on July 7, 2018. ^ "Magnolia Trace Elementary attendance boundary." St. Tammany Parish Public Schools. Retrieved on July 7, 2018. ^ "Tchefuncte Middle School attendance boundary." St. Tammany Parish Public Schools. Retrieved on July 7, 2018. ^ "Lake Harbor Middle School attendance boundary." St. Tammany Parish Public Schools. Retrieved on July 7, 2018. 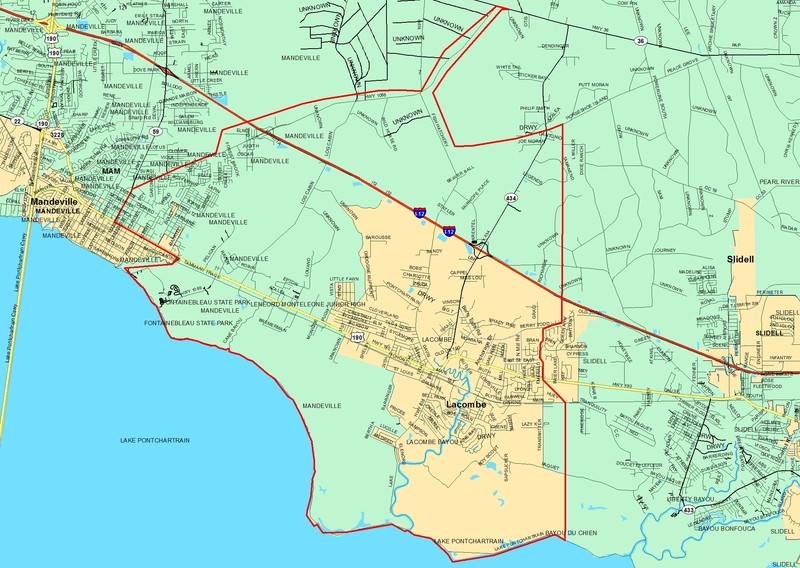 ^ "Mandeville Middle School attendance boundary." St. Tammany Parish Public Schools. Retrieved on July 7, 2018. ^ Mandeville Junior High Boundary. St. Tammany Parish Public Schools. Retrieved on July 7, 2018. ^ "Fontainebleau Junior High Boundary. St. Tammany Parish Public Schools. Retrieved on July 7, 2018. ^ "Monteleone Junior High Boundary. St. Tammany Parish Public Schools. Retrieved on July 7, 2018. ^ Mandeville High Boundary. St. Tammany Parish Public Schools. Retrieved on July 7, 2018. ^ Lakeshore High School attendance zone. St. Tammany Parish Public Schools. Retrieved on July 7, 2018. ^ Fontainebleau High School Boundary. St. Tammany Parish Public Schools. Retrieved on July 7, 2018. Wikimedia Commons has media related to Mandeville, Louisiana. This page was last edited on 6 April 2019, at 18:19 (UTC).